Dry the wood gently. Don't bake it !! We had cut and sawn a lot of timber by 1984 when we started serious woodworking. I had a metal building with 20,000 board ft of clear oak stacked under it. We had been sawing and selling lumber since we moved onto our 160 acres in 1978. I was well aware of the dangers inherent in the entire operation, especially logging. The birth of our twin daughters in March, 1984 and our son 18 months later gave me cause to reflect. We felt that a less dangerous endeavor would suit our new situation. There was no scarcity of lumber for the new effort, but the driest that it would get by air drying was 12% to 14% To build furniture, we would need it kiln dried down to 6%. The one local kiln was at the plant that made truck flooring. To make a long story short, that attempt was a disaster. The quality of the wood coming out of the high temperature steam kiln was abysmal. The alternative was to truck the wood somewhere and back, to a kiln that could dry it properly, or find an on site option. We acquired our Nyle Dehumidification Kiln unit in January, 1987. I built a 16' X 25' room with a 14' high ceiling onto the existing shop. The floor slab was poured on top of four inches of high density foam insulating board. The walls were actually two walls that were sixteen inches apart. Both sides of the walls were covered with galvanized roofing and we blew the space between them full of sawdust. We capped the entire room off with thirty six inches of sawdust blown in above the ceiling. We had a room that was insulated like an old time ice house and was completely airtight. A large gasketed door was put on one end to load the lumber into, and a smaller one through the adjacent shop wall to check on the drying progress. We bought a moisture monitoring system and meter. We could then place probes in eight places in the kiln and monitor the drying of the wood on an hourly basis from the outside. The dehumidifier was placed in the room and a drain hose was put in a floor drain under the slab. A large attic fan was mounted on the ceiling pointing from one side of the room to the other. 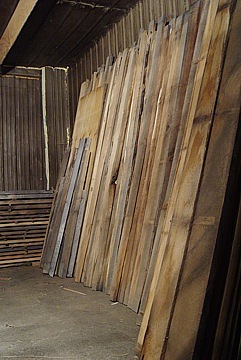 When the wood is put into the kiln it is stacked on small, 1" square boards or "stickers" that allow air to circulate across each board in the pile. There is a precise way to place and align the stickers or one risks warping the lumber. The airflow must be kept equal in all parts of the kiln, so there is a lot of manipulating of the air passages to assure even drying throughout the room. Baffles are placed between the top of the piles and the ceiling, and the only large passage from one side of the room to the other is through the fan. When it is turned on, the air is drawn across the entire 5000 board ft of lumber and through the fan, back to the front and through the fan again, over and over. When the kiln unit is then turned on, it begins to gently heat the room and slowly remove the moisture from the air. There is a precise ballet of the temperature of the room, the moisture content of the lumber, and the humidity of the air. One six hour error in any of these parameters, and the lumber can be ruined in a variety of ways that render it unfit for furniture. 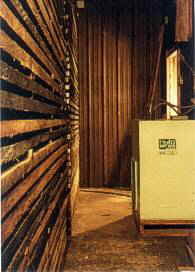 The entire process proceeds to its final stage of 6% moisture content in the lumber over a period of 28 days, the temperature in the kiln never exceeds 115F.